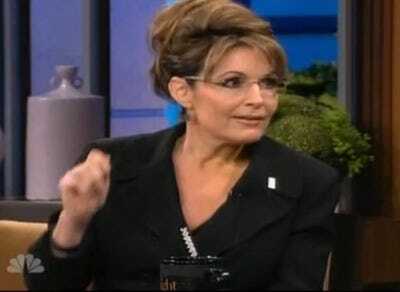 Former Alaska governor and current Fox News contributor Sarah Palin appeared on Jay Leno’s second night back in his Tonight Show timeslot. She is one of his huge guest gets of the week, and the interview was everything you’d expect it to be: Rehearsed, but full of Palin’s signature phrases, a few digs at the White House — and a some surprises, too. Jay asked Sarah if she thinks she’s controversial. Sarah said she has strong ideas and solutions and wants to talk about them. “I’m not one to sit down and shut up,” she said. “I’ve always been quite confident in the road I’ve been on,” she said. Jay says the media “pokes” her to get a rise out of her. Has she learned her lesson? “What I would desire is more opportunity to follow up on a comment I made,” like when her comments about the Family Guy episode broke. “Jay you’ve gone through this too, especially in the past few months it seems,” Sarah said with a grin. Jay giggled from his chair. “A leeittle bit,” he responded. “It’s like that old saying, oh, I can travel half way around the world before the truth can get its pants on in the morning,” she added. In the second half of the show, she stood up and did her own comedic monologue. She compares Alaska to Los Angeles. “Here when people have a frozen look on their face, I find out it’s Botox,” she said. She also takes a dig at Obama’s healthcare plan, the vice presidency, and even joked about appearing as Tina Fey at a show. Watch her whole sit-down with Jay.